Feeling like an all-star? 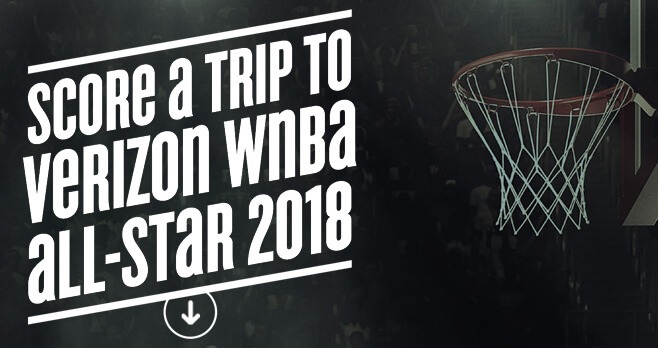 Enter the Verizon WNBA All-Star 2018 Sweepstakes online at wnbaallstar2018.com or during select WNBA Games and you could score a trip to Verizon WNBA All–Star 2018. Ends: 11:59:59 PM ET on 7/13/18. Prize: A 3-day/2-night trip for two to Verizon WNBA All-Star 2018 in Minneaplois, MN on July 28, 2018 consisting of round-trip coach air transportation from major airport nearest to winner’s residence in the U.S., standard double-occupancy hotel accommodations (one (1) room), two tickets to the WNBA All-Star 2018 Game and ground transportation to/from the airport and the applicable hotel (Approximate Retail Value = $4,000). Eligibility: The Verizon WNBA All-Star 2018 Sweepstakes is open to legal residents of the 50 United States and the District of Columbia, who are 18 years of age or older (or of the legal age of majority in their state of residence, whichever is older).